But something’s missing—your grammar is a mess. If you missed your verb conjugation class at school and still can’t tell the difference between an -AR and an -IR verb, help is here. 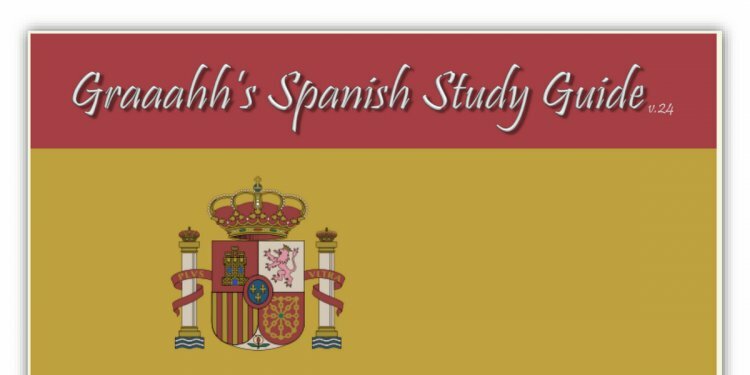 Why Is Spanish Grammar Important? Although vocabulary may often hold the key to making yourself understood—walk into a shop and say pan (bread) for example, and you’ll likely come away with the desired product—grammar is equally crucial to getting your point across. The verb vivir in this sentence is conjugated in the first person in the present tense, giving us vital information that the person talking currently lives in Barcelona. Then the listener has no idea who the sentence refers to or whether the speaker is referring to the past, present, future or a hypothetical scenario. Aside from the communication breakdown mixing up your verbs can cause, conjugating your verbs correctly will make you sound like a much better Spanish speaker. Many native Spanish speakers consider conjugating verbs one of the most challenging aspects of learning their language, so get those verb endings right and you’ll be sure to impress! In order to make the present tense in Spanish you must use the root (stem) of the word and then add on the appropriate ending, according to the subject and verb type (-AR/-ER/-IR). And then the endings change for each verb type, so let’s take a look, beginning with our -ar verbs. bailo, as in: Bailo todas las mañanas (I dance every morning). bailas, as in: Bailas todas las mañanas (You dance every morning). baila, as in: Baila todas las mañanas (He/she/it/you singular formal dances every morning). bailamos, as in: Bailamos todas las mañanas (We dance every morning). bailáis, as in: Bailáis todas las mañanas (You (plural) dance every morning). bailan, as in: Bailan todas las mañanas (They dance every morning). You’ll notice that the endings for the -ER verbs are almost the same as the -AR verbs, except they use an “e” and not an “a”. The first person is the same. Como una hamburguesa (I eat a hambuger). Comes una hamburguesa (You eat a hamburger). Come una hamburguesa (He/she/it eats a hamburger). Comemos una hamburguesa (We eat a hamburger). Coméis una hamburguesa (You guys eat a hambuger). Comen una hamburguesa (They eat a hambuger). And now that everyone wants a hamburger, let’s move on to the the -IR verbs! The -IR endings are very similar to the -ER endings; the only differences are in the nosotros and vosotros forms of the verbs. Vivo en Buenos Aires (I live in Buenos Aires). Vives en Buenos Aires (You live in Buenos Aires). Vive en Buenos Aires (He/she/it lives in Buenos Aires). Vivimos en Buenos Aires (We live in Buenos Aires). Vivís en Buenos Aires (You live in Buenos Aires). Viven en Buenos Aires (They live in Buenos Aires). The only way you’ll be able to master the present tense is through practice, practice, practice. Do grammar exercises, make up sentences in your head, recite the endings over and over again to yourself. Do whatever works until you can remember which ending is which and apply them appropriately. It would be great if that were all there is to it, but the fun doesn’t end there. Once you’ve got the regular verb endings down, it’s time to introduce the bane of all language learners’ lives: irregular verbs. Some verbs change their stem in the present tense. Note that the stems of these verbs change in all forms except nosotros and vosotros. They’re usually categorized by the type of change, for example “o → ue” and “e → ie”. These stem-changing verbs are often called “boot verbs, ” and here’s why: When you organize the verb conjugations into two rows, the forms whose stems change look like a boot. Can you see the boot? The toe of the boot is made by the Uds./ellos/ellas form, acuestan. If you’re feeling a little lost, don’t panic. All Spanish learners felt this way at some point, but the good news is that learning all these verbs is possible. Once you get used to the irregular verbs, they’ll come to you naturally and you’ll soon find your own ears wincing when listening to an improperly conjugated verb. Other verbs are irregular in the first person, yet regular in all other forms. These are relatively simple to learn. Other similar verbs are hacer (hago) and tener (tengo). Decir (digo) and venir (vengo) are both “go” verbs and also stem-changing verbs. Other irregular verbs in the first person are: ver (to see), which becomes veo, and saber (to know), which becomes é—as in yo sé, or I know. There are three verbs that are so irregular they get their own special category: ser (to be), estar (to be), and ir (to go). Estar (to be) seems almost normal, until you see the accents. Just to confuse matters further, some verbs change their spelling in the present tense. Luckily, there are rules that dictate when this happens.